A Rangers supporters group has written to the Alternative Investment Market calling for an investigation into the club's board. The Rangers Supporters Trust wants AIM to "determine if [the board's] actions favour one related party". The letter follows the Ibrox board accepting Mike Ashley's loan offer when other funding proposals had been made. "We believe our interests may be being overlooked in favour of one particular shareholder," wrote the RST. Ashley owns a little under 9% of Rangers, as well as being the owner of Newcastle United Football Club. The Englishman's Sports Direct is also currently a partner with Rangers in the commercial joint venture Rangers Retail Limited. Among the conditions of Ashley's loan was that he would have two representatives appointed to the board of The Rangers Football Club. Derek Llambias, the former Newcastle managing director, has since been appointed as a consultant at Ibrox then a non-executive director of RIFC. Alternative funding offers were made by Brian Kennedy, who was willing to provide a £3m loan, and Dave King, who was prepared to offer, in conjunction with a consortium, £16m in funding, in return for a portion of equity and control of the board. Ashley's loan - which was backed by directors James Easdale, whose brother Sandy owns 5.21% and holds the proxy votes for a further 20.94%, and Norman Crichton, who represents Laxey Partners, who own 16.32% - is likely to be enough to tide Rangers over until the turn of the year, by which time further funding will be required. 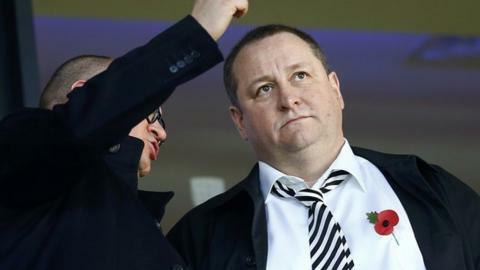 The Newcastle owner may underwrite a share issue, but under the terms of an undertaking reached with the Scottish Football Association, he is currently limited to not holding a stake of more than 10% in RIFC. "We write as a shareholder to express our deep concern over the stewardship of Rangers International Football Club plc and ask that you carry out an investigation into the current and previous board of directors to determine if their actions favour one particular related party, namely Mr Mike Ashley and his company, Sports Direct," wrote the RST. "We are aware that an alternative offer of a larger loan on similar terms was made to the company, but the board chose to accept the smaller loan from Mr Ashley. "Mr Ashley owns a controlling interest in another football club, Newcastle United FC, and ownership of more than one football club is not permitted by football authorities. "We believe in placing two of his representatives on the board of RIFC, Mr Ashley is clearly influencing operations, which may violate his agreement with the SFA. "This could put the football club at risk of sanctions. Indeed, we understand that the SFA has written to Rangers and Mr Ashley for clarification. "We believe this is an unacceptable risk to the business, particularly when an alternative offer of short-term funding was available. "The Rangers Supporters' Trust represents over 2000 members with a group shareholding in RIFC and we believe our interests, as well as those of thousands of other shareholders, may be being overlooked in favour of one particular shareholder/related party. "As such, we ask that you carry out a full investigation with some urgency."